Secure parking available nearby for 200 CZK / day. Extra bed is possible in most of rooms for 500 CZK / day. There are no single rooms / discounts for single use. More rooms on request only (send us Info & availability request). Hotel Svambersky Dum in Cesky Krumlov is one of the most centrally located – in the very heart of the historical town, right bellow the main square. Hotel building is from the beginning of 16th century and Gothic features are well preserved. Medieval facade and frescos combined with wooden amenities and beams let you feel relaxed in medieval era atmosphere. Cesky Krumlov hotel / pension Svambersky Dum meets demands of modern accommodation due to a reconstruction, which took place recently. Company / private parties, weddings etc. can be arranged. 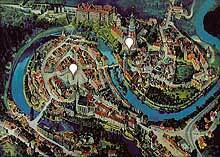 It is not allowed to park in the historical protected area of Cesky Krumlov…guarded parking is available near the Hotel Svambersky Dum for a fee 200 CZK / day (receptionist will navigate you once you come to unload your luggage). There are 6 rooms. Each room is unique and has private bathroom. Some rooms have view of the castle. Children up to 2 years are free of charge (however, baby cots are on request only). Medieval origin building with preserved cellars and facade is home of Cesky Krumlov Hotel Svambersky Dum. Facade is really one of the most remarkable in Cesky Krumlov. Original decoration of such an extend is a rarity you will admire. An underground access from the cellar used to lead into courtyard and across the street. Cellar features simple rectangular Rennaissance portal and stone vaults. Medieval origin vaulting is on the ground floor section. The top floor and ground floor were reconstructed in the 1960. Burghers (Mates Platner) build house in 16th cemtury. Later other burghers lived here, followed by butcher, brewery, carpenter and finaly again burhers. located near to the Main Square. Rooms with views of the Castle. Well designed, wheelchair accessible. Small garden in courtyard. Charming hotel in an old building right in the heart of Cesky Krumlov. Original rooms with antic farniture.